Directions: Between N. Randolph & Little Valley, NY. Drive 4.6 miles E. on Rte 242 from the inter Rte 394 in N. Randolph. 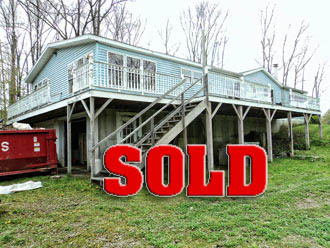 Only minutes from Holiday Valley, E-ville, NY. Secluded ranch home w/ horse barn on 9.3 acres & a beautiful view. 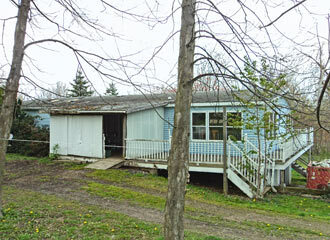 •	1,848 SF manufactured ranch home built in 1990. •	Situated in a picturesque, secluded, and wooded hillside setting. •	3 bedrooms, 2 bathrooms, kitchen, 2LR & 2 DR on the main floor. 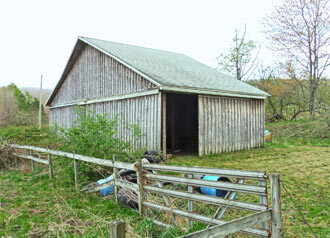 •	Detached 30'x 40' horse barn w/ 2 stalls, loft, sliding doors, electric & water. •	Finished ground floor w/ 4 rooms, ½ bath, 8' ceilings, cement floor. •	Ground floor potential for additional living, a large workshop or an office. •	Attached drive under two (2) car garage w/ OH doors and walk out man door. •	A wrap around open deck porch provides a wonderful countryside view. •	Wildlife and habitat flourish in this spacious 9 acre property. •	The mature hard wood trees provide terrific shade and landscaping. •	Small man-made mini pond that is spring fed. •	Fully insulated and energy efficient w/ plenty of closets and storage. •	Forced air heat and air condition system makes it climate-controlled. •	Private 180' water well; private septic, propane gas & low cost Little V. Electric. •	Laundry hookups on both the main floor and ground floor. •	Lot size: Irregular shape parcel w/ 9.3 acres and 30' Lf frontage on Rte 242.